LOCATED at WILLOW GROVE, 760 Merrimans Lane, Winchester, Va 22601, up the drive on the left hand-side, under the willows and by the lake on SUNDAY, JULY 28th 3pm-7pm. BRING A BLANKET, CHAIR and a SMILE! Tickets are $15 each. KIDS under 12 ARE FREE! Can purchase online in advance or at the event. 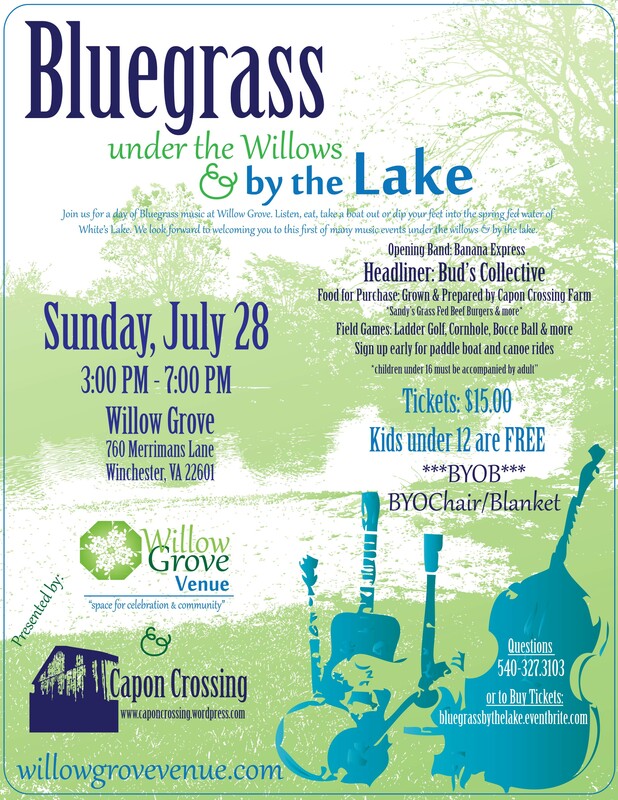 In addition to great bluegrass music by Bud’s Collective and Banana Express, we’ll have field games (like bean bag toss, bocce ball, badminton, etc) and food for purchase by Capon Crossing (all natural grass-fed beef burgers, homegrown potatoes and more).